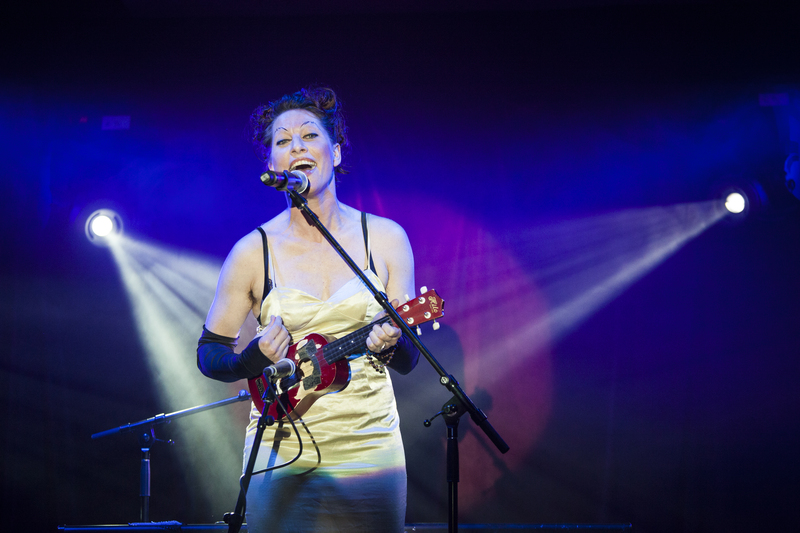 I have to confess that I was an Amanda Palmer virgin – in the sense of never having seen her live – until now. I’ve read about her, of course, and I’ve heard her songs but never encountered her up close, in the flesh. My 20-something plus-one, meanwhile, knew nothing about her beyond her letter supporting Miley Cyrus’s right to twerk. We were both blown away. The post-punk cabaret star, who was one half of pioneering cabaret duo The Dresden Dolls, has toured here regularly, most recently with her new band the Grand Theft Orchestra.This time it’s just her on keyboard and ukulele performing in the decadent timber and mirrored surrounds of The Spiegeltent – a venue that seems almost tailor made for her – for Sydney Festival. We heard her before we saw her, as robust strumming on the ukulele from the back of the tent heralded her entrance. Singing “In My Mind” unplugged she wandered through the tent before hitting the stage. In slinky, cream satin vintage gown with long black gloves, fishnets and those famous, arching eyebrows, Palmer has a charisma that quickly draws you into her orbit as she weaves an almost immediate, spell-binding rapport with her audience. Her patter moves from the droll to the personal and pointed. Her gorgeous, versatile voice cajoles and seduces. She reduces you to mirth one minute and breaks your heart the next, seemingly effortlessly. Her repertoire ranged from the comic “Vegemite (The Black Death)”, which she wrote for her author husband Neil Gaiman who unlike Palmer loves our yeasty spread, to an intense version of Ted Egan’s “The Drover’s Boy”, during which performer Sabrina D’Angelo emerged from a Drizabone and Akubra to heighten the drama of the song. Other numbers included “Map of Tasmania”, Palmer’s joyously cheeky ode to the unclipped female bush, the Dresden Dolls’ perky “Coin-Operated Boy”, Bat for Lashes’ “Laura” sung as a beautiful duet with Brendan Maclean, also dressed in a slinky slip with a spiky blonde quiff, and a moving song about her tough last year. She ended in upbeat fashion with “Ukulele Anthem”, her paen to the power of music and creativity even if – or especially if – it’s on a simple ukulele that anyone can learn to play. It was a beautifully balanced song list from across her career that would have delighted fans (though there was no number from her latest album “Theatre is Evil”) as well as serving as a brilliant introduction to newbies. After the first show Palmer tweeted: “oh my god that was surreal. so many people who didn’t know me at all. this festival is going to be actual WORK.” But work that will doubtless win her umpteen new Aussie fans. During the show she confessed to being “obsessed” with Australia. Right back at you Miss Palmer! Come back soon. This entry was posted in Cabaret and tagged Amanda Palmer, Brendan Maclean, Sabrina D'Angelo, Sydney Festival, The Dresden Dolls by jolitson. Bookmark the permalink.